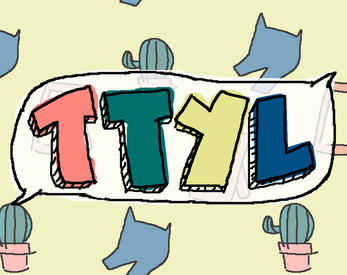 TTYL by yams makes games! With our game TTYL, we wished to create a space in which our players would be encouraged to reflect on the method with which they resolve problems in relationships with people they care about. We wanted to emphasize the idea of time as a necessary component in effectively thinking about one’s actions and understanding the perspectives of others. We felt that the best way to present this type of experience was through a narrative-focused game that gave the player opportunities to make decisions about what they believed would be the correct course of action. To push the narrative and present methods for going about solving the problem we used three NPC’s, each giving better advice for the situation than the last. We did that to show that the more time one gives to a problem and the more perspectives one listens to, the better their answer would become. Our aesthetic intention was to use a pleasant color scheme and cute characters to elicit feelings of serenity and ease in order to further promote an environment for thinking about ways to go about solving the problem. We wanted TTYL to play in a way that would make the player wonder what would happen had they gone with option ‘A’ instead of option ‘B’, using the player’s own curiosity to show them possible outcomes that could result in following certain types of advice. By exploring the options, we hope that the player would gain a better understanding of what could happen if they were to apply such methods to similar real-life situations.